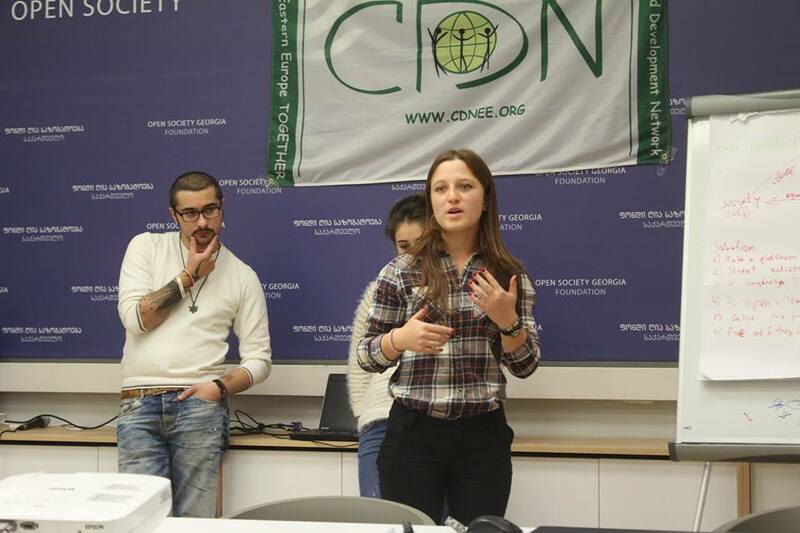 CDN and the Georgian Young Greens have a tradition of organising Caucasus Regional meetings since 2011. Regional meetings gather young greens and green activists from all over the South Caucasus to discuss joint challenges of the region and to set the strategies to solve the problems. The purpose of these meetings is to strengthen and support cooperation and exchange between young people, provide them space and a platform to build bridges between their actions and political struggles under the Green umbrella. This year, the topics identified as very important for CDN members in the region were LGBT+ rights, Climate Change and Freedom of Expression. However, the main focus was on LGBT+ rights and violation of those. The fully-packed 2-days program started with an introduction to the three main topics and with the sharing of the struggles the participating organisations are facing and the methods with which they are working on overcoming their obstacles. From there, we continued with an overall presentation and discussion on the current situation regarding climate change in the region, which was followed by three case studies of mutual challenges in the three countries that participants were invited to offer their solutions for. The conclusions on Climate Change can be found HERE. We were happy to co-host the panel on LGBT+ rights in the region with the Women Initiative Support Group Georgia (WISG) and to receive a comprehensive analysis of the position of and attitude towards LGBT+ people in the Georgian and Armenian societies from Natia Gvianishvili, the WISG’s director. The analysis of the LGBT+ community’s position in Azerbaijan was presented by Gulnara Mehdiyeva, LGBT activist of the MIL Network, Azerbaijan. On the 17th of May 2013 a shocking event happened in Georgia which left the LGBT+ community and the human rights defenders terrified. Instead of a peaceful gathering organised by the local activists, a homophobic rally, a self proclaimed “counter action” with clearly violent tendencies towards the community left a sad mark on the International Day Against Homophobia in Tbilisi. Thousands of protesters, led by the Georgian Orthodox Church, were allowed to break through a police cordon protecting the LGBT+ activists, and violently pursued them, beating some of the attendees and throwing stones at them. In Georgian mainstream media, this issue has been downplayed and was presented as being less violent and endangering than it was in reality. The documentary ,,Vachnadze Street” pictures what really happened that day and reflects the significant role and influence the Orthodox Church has in the national politics. The conclusions on LGBT+ rights in the South Caucasus countries can be found HERE. The meeting’s outcome are two initiatives: one on the ecological issues in the South Caucasus, particularly on the pollution of the Kura river flowing through two of the countries. The initiative’s aim is to raise awareness of the dangers of water pollution to both the ecosystem and to the lives of humans inhabiting the banks of the river, as well as to organise an action tackling the problem. The second one was shaped in an idea of lunching a set of activities on sensitivisation of the young people on women and LGBT+ issues in the region trough artistic activities such as theater, video-art, performances etc. Many similarities were identified in the three countries during the discussions, from corrupted political systems to the role, position and opportunities/challenges of the Greens in the region and therefore the gathering has been positively evaluated by the participants and by our members. It should be noted that given the geopolitical situation of these three countries, especially the relations between Armenia and Azerbaijan an important added value of the meeting was bringing together young activists from these countries who otherwise would have very limited opportunities for mutual exchanges, if any at all. All the participants expressed a need to organise Caucasus Regional Meetings at least once a year and emphasised the importance of events which are focusing mainly on the socio-political issues of the three countries. Report from the Caucasus Regional Meeting in 2015 can be found HERE. We are looking forward to continue the cooperation in the region and to the follow-up on the meeting. This entry was posted in Regional Work, Uncategorized. Bookmark the permalink.